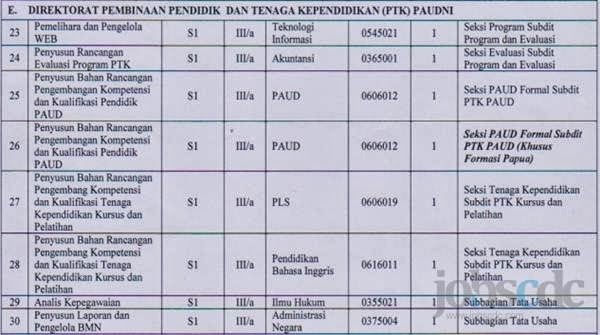 Direktorat Jenderal Pendidikan Anak Usia Dini, Nonformal dan Informal Kementerian Pendidikan dan Kebudayaan Republik Indonesia – Ditjen PAUDNI or the Directorate General of Early Childhood, Non-Formal and Informal Education of the Ministry of Education and Culture of the Republic Indonesia is a working units in the Ministry of Education and Culture. The Directorate oversees the field of Early Childhood Education, Non-Formal and Informal in Indonesia. PAUDNI is based in Jakarta and headquartered in Jl Jenderal Sudirman Gedung E Lantai III Senayan, Jakarta 10270. PAUDNI is supported by 4 directorates, namely Directorate of Early Childhood Education, Directorate of Community Education, Directorate of Coaching Courses and Training, and Directorate of P2TK PAUDNI. 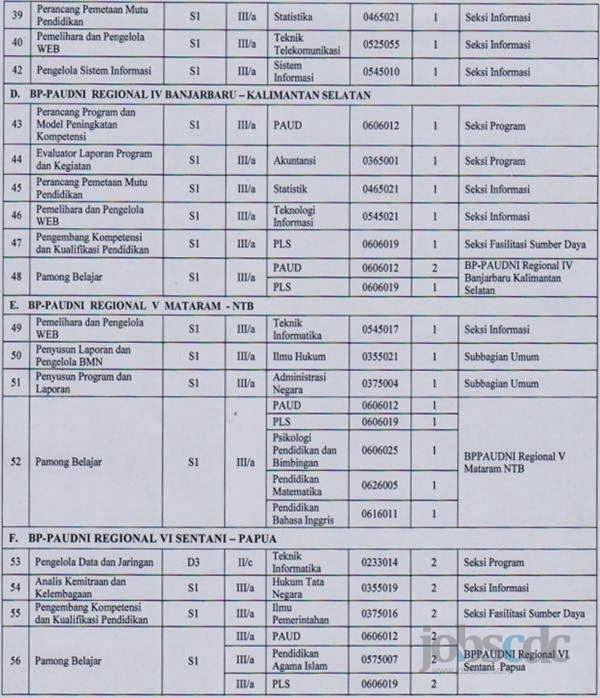 The Directorate also supported by 8 regional offices, situated in Bandung, Semarang, Medan, Surabaya, Makassar, Banjarbaru, Mataram, and Sentani. PAUDNI is lead by a Director General and currently lead by Lydia Freyani Hadawi. Development of national education in the future based on the paradigm of building whole Indonesia serve as human subjects who have the capacity to actualize the potential humanitarian dimensions as well as optimally geared to improving the quality and competitiveness of HUMAN RESOURCE Indonesia on knowledge-based economy era (knowledge-based economy) and creative economic development. Non-formal and Informal education part of national education attempt to actualize the potential humanitarian dimensions and from the realm of cognitive, affective, and psychomotor imposed throughout the lifetime of a systematic process to enhance the dignity of human beings holistically, it would be a strategic vehicle for efforts to develop all the potential of the individual, so that the ideals of human whole Indonesia building can be achieved. Currently, the Directorate General of early childhood education, non-formal and Informal (PAUDNI) has established a policy and program development, early childhood education, non-formal and informal education that includes arable areas and objectives that extends along with the policies of the Organization and structuring the work Ministry of national education. Based on the regulations of the President of the Republic of Indonesia number: No. 67 of 2010 about the position, duties, and functions of the Ministries, as well as the arrangement of the Organization, duties, and functions of the Echelon I ministries. Dit PAUDNI policy and early childhood education program (PER), community education, courses and training, educators and Educational Power PAUDNI, as well as a program of study, development and control of the quality of education and support program management and other technical Implementers. Dit PAUDNI policies and programs the year 2011 is geared to meet the demands of increased quality of service and keep working to continue to encourage the availability and accessibility of educational services. Dit PAUDNI organises functions increase the availability and affordability of service standards PER min. PER service and encourage quality improvement services simultaneously, holistic-integrative and sustainable, in order to realize the children’s intelligent, creative, healthy, cheerful, noble character in accordance with the characteristics of the child’s growth and development, so it has a physical as well as mental preparedness to enter further education. Besides running a uapay in improving the quality of service PAUDNI program through the development of a model and a pilot program conducted by the Regional centres and UPT. 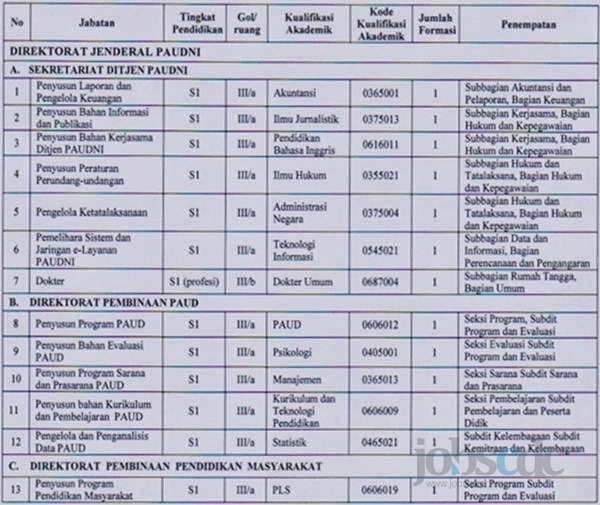 Increase the availability, affordability, quality, equality and finality of service PAUDNI program through the implementation of the work programme of PAUDNI by the Regional Office of education of the province and Kabupaten/Kota and PAUDNI agencies that are managed by the community. Increase the capacity of institutional PAUDNI, both at regional and central level through improved information management system, improved infrastructure and facilities are adequate, in order for the Agency PAUDNI was able to provide excellent service to all citizens and ensured its continuity and certainty. Description of tasks and functions the Dit PAUDNI had the vision that This educational service for the realization of an intelligent, Indonesia insan skilled, independent, and professional “is the goal to build early childhood education, non-formal and informal, which is directed at the whole Indonesia human development adopting noble as learners throughout the lifetime of the employee able to actualize itself optimally in a variety of circumstances and future challenges. On the other hand the Mission of PAUDNI is to facilitate educational services to learners evenly, good quality, relevant, and reach goals that are not served by formal education through the holding of early childhood education services, provision of public services, the provision of the services of organizing courses and training, provision of services and produce educators educators-formal educator, life skills education, and other education aimed at developing the abilities and potential of learners. 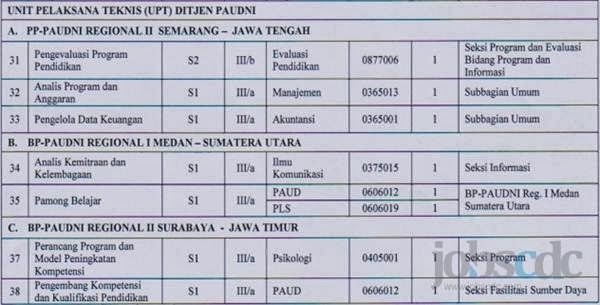 Usia paling rendah 18 (delapan belas) tahun dan paling tinggi 35 (tiga puluh lima) tahun. Registration online through cpns.kemdikbud.go.id (23 September 2013 – 7 October 2013). Copyright © All right reserved. | Theme: Newslite by eVisionThemes - 23 q. 1.001 s.